Classy cables and plush crocheted buttons add just the right punch of decorative detail to these fabulously comfortable foot warmers. 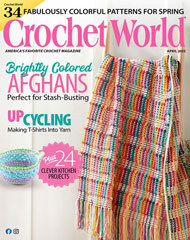 This e-pattern was originally published in the September 2010 issue of Crochet! magazine. Size: Includes women's 9" through 11" sole and men's 9 1/2" through 11 1/2" sole. Made with medium (worsted) weight yarn and sizes E (3.5mm) and G (4mm) hooks.